This post says most of what I would want to say on the subject but to add something new personally, for me it was Chinese Cinderella and the Secret Dragon Society. It was beautiful and made me think philosophically at a young age. This made me fall in love with China and want to learn more about Chinese philosophy as well as take it on board and apply it to my own life. Books are powerful things. They can introduce us to new ideas. Give us the courage to do what we couldn’t do before. Even transform our lives completely. Waterstones is inviting readers to tell their stories about the books that have made a difference to them in The Book that made me There are lots of stories to read from all sorts of people. For me it was Alan Garner’s The Weirdstone of Brisingamen read to me at school (thanks Mr Brennan) and Alison Uttley’s A Traveller in Time which I found on the classroom bookshelf. They were the first books that took me so completely to another place and time and showed me how powerful a book can be. What book changed things for you? I will be reading and reviewing Landy’s latest book as soon as possible when it is released (Waterstones is offering a release date of 29th August, 2013) but in the meanwhile, Aiden Bracher on YouTube has recorded and posted a video of Derek Landy reading a chapter from The Last Stand of Dead Men. Thank you to derek-landy (just a fan site) over on Tumblr (http://derek-landy.tumblr.com/) for posting the video on their account for us Minions to enjoy. Much appreciated! EDIT 15/08/2013: Just to make sure everyone who visits this post is aware, I have posted another video of Derek Landy reading the first chapter of the next book here. I finished this book Monday and was intending to get the review up then but that didn’t happen due to life. Taken is the third book in the Alex Verus series and this one sees him plunged yet again into danger with his new apprentice, Luna. In the review for Cursed, I commented that Jacka had seem to recycle the format of the first book and I expressed fears that this would be repeated in book 3. These fears were unfounded though as the format is well and truly broken. No Elsewhere, much less of the alliances and more focus on Alex and his skills and use of his divination magic and wit to get through battles. I didn’t speak of this in the last review, though it did feature briefly in another way, but Alex had to use his brain to get past the fact that his magic is being blocked to a certain point in this book. All of this made me smile and happy that Jacka had gone off in a different direction when plotting and structuring this novel. This book seemed darker to me compared to the earlier ones and more danger and threat was included but this made the book more enjoyable to me. Again, Jacka has expanded his world and showed more of it which I feel he is very clever in doing and I read his books as a writer of fantasy myself and learn from them. The fight scenes are better than in Chosen I feel, more active and the type that was seen in Fated, the first book. Alex and Luna are forced to fight in unique ways against enemies who are able to use more offensive magic against them but this makes the battles more interesting and draws the reader in further. I have only two criticisms for this book. The first is the fact that I worked out who and had an inkling of why the antagonist was doing what they were doing before Alex figured it out. Whether or not Jacka intended for this to be the case, I do not know but it annoyed me somewhat that Alex failed to do so as early as I did. Yes, it is a weak criticism but I do honestly think this. The only other one I have is that the ending seemed a little drawn out and maybe could have been condensed by a page or two. All in all, this book is better than Chosen (which suffers somewhat from the second book slump) and feels darker and has more danger in it providing a real sense of threat towards the characters than any of the earlier ones. The change in structuring prevents a feeling of déjà vu as well the limited removal of Alex skills, forcing him to use his brain and not his brawn to defeat his adversaries. I know I haven’t posted for a couple of days but life got in the way. I have however finished another book, as well as this one, in the last few days so I will be posting two reviews today. Moving on, this particular book is only a short book so this will probably be only a short review. More Weird Things Customers Say In Bookshops is the sequel to the original book and features conversations and quotes from customers in bookshops, either to the bookseller or to another customer, which have happened in either in the shop that the author works in or from other bookshops and libraries around the world. There is also a section about quotes from customers from when Jen Campbell was signing copies of the original book. The original book kept me giggling and laughing and this book was no different. One of the quotes left me literally crying with laughter (I will post it at the end of this review) whilst others left me as confused as the booksellers and the librarians featured in the book. It also left me wondering about some of the customers. I can’t describe what I mean as I can’t even put my thoughts into words. I think the best way to describe it is that it just leaves me wondering and makes me question how some people’s brains work. I think everyone knows those people that they sometimes are left wondering about and I think that some of those people must feature in this book. The last section also shows that some people have some pretty weird ideas and shows that some traditional ideas about writers still persist. CUSTOMER: I need to return this book on ghosts. BOOKSELLER: Is there a problem with it? Sorry about not posting yesterday. I had nothing to review so opted not to post. Not long after becoming a fully-fledged Ranger and settling into his new fief, Will is sent North to an important strategic point in the kingdom, undercover to investigate rumours of a sorcerer who has risen from the dead who has placed a curse on the Lord of the fief. However, as always, there’s more going on than meets the eye. Compared to Ruins of Gorlan, this is much better paced and the book is plotted well. The beginning can seem confusing initially as to why it is even there but it does later become apparent as to why it is there. It holds the same fun and spirit as Book 1 and Book 11, the same humour though this definitely has a spy thriller feel to it which is markedly different and a change from the previous books. This is not bad as it is a nice change of pace and I rather enjoy it. It might be a spy thriller but it is different from what you might think of as this is set in a medieval time zone. In saying that this one is better paced (which it is! ), it does seem somewhat rushed though, jumping from this plot point to that. There is also the fact that the beginning does seem tacked on despite what I say about why it is there. Maybe the beginning could have been rewritten and improved somewhat. There is also something else which affects the whole series I feel. The series is advertised on the back of the books as the reader being able to read them in any order as “each book is a standalone adventure”. I feel this is not true. As I say, this affects other books in the series too (I have only read 1-5 and 11 so far). Yes, Will completes his mission in this one but it then continues on with other story lines that have been started leaving it wide open for book 6. Does this make it a standalone? In my opinion, no. Book 1 is not so affected by this (ties off a lot of threads very nicely I feel) and book 11 is not affected at all as that book is a bunch of short stories. Even so, I feel that no, the books are not standalone adventures that can be read in any order, but must be read in a certain order so the reader can keep the story lines straight in their heads. It seems odd to me that they would be advertised as such. Despite this, I did like this book and the spy thriller element in a medieval world is very appealing and different. The book is still appropriate for children and continues the adventures of Will Treaty very well. I am going to read book 6 at some point, once I have finished the other books I have that need reading! Probably the only review I am going to post here today. I re-read this in a day and thoroughly enjoyed it. I also found myself smiling as I managed to read into and see the things I had struggled or failed to do so when I first read it aged 14. I did not discuss this when I reviewed Ranger’s Apprentice 11 but I found myself admiring the level of research Flanagan must have had to do into Britain and Europe to get the medieval details correct and to be able to changed the information to a certain degree for his AU version of Britain called Araluen. I also loved that he included a bullying storyline and showed the effects bullying to can have on any person. There was also the friendships that made me smile, whether it was the one between Will and Gilan, Halt’s former pupil, Will meeting Tug and becoming very attached to him very quickly or the rivalry turning to respect between Will and Horace. The fighting sequences are well paced out and choreographed and the story in general kept me entertained and drew me in. I found myself struggling to put the book down, I enjoyed it that much. The writing is also witty and found myself giggling happily at it. The only thing I think I can criticise is the fact the story did get a little slow in places and then pick up and have the majority of it towards the ending, making it a little unbalanced but not to the point that it was hard to read. This book is fun and would definitely be the ideal book to give to boys to get them into reading (indeed, the book originated from short stories Flanagan wrote to get his own son into reading). That is not to say that girls would not read it and is definitely the sort of book that I think would be at home on 10+ year old child’s bookshelf. Yes, it’s a kids film. No, I don’t care. The film is a rather simplistic in it’s story, with a good vs. evil plot line and is definitely for kids but I do like that there is a (very mild) environmentalist. I also like that the love story between MK and Nod is only there in the background and is not overpowering. There is also parallel story lines about familial love between a (surrogate) father and child (Nod and Ronin, MK and her father). I found this very appealing and enjoyed seeing it as I don’t think I have come across that before in other films or books I have read (whether for adults or children). There is a lot of fighting in this film but none of it is over the top and the death of the queen is very well handled and I don’t believe this film would cause any nightmares for children. What also appealed to me was the visual look of the film. I saw this film in 2D and have heard reports that it looks brilliant in 3D but going on what I saw today, everything was so detailed and amazing. The flying sequences, whilst not on the same level as the ones from How To Train Your Dragon (2010), made you believe that you were flying with them but didn’t quite have the same effect as HTTYD. It had the shiny look to be expected from an animated film for kids but the visuals, combined with everything else, drew me in and I found myself believing everything I was seeing. It even made me stop, for a short time, analysing the film and it’s writing just to enjoy it (which can be very difficult to do). 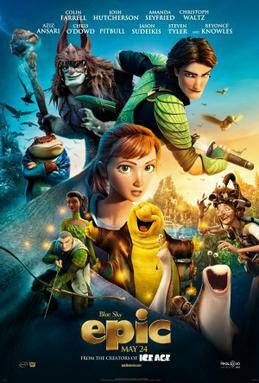 I thoroughly enjoyed this film, despite it very much being a kids film, but the family love story, the (again, very mild) environmentalist story, the visuals and the fighting sequences all combine to create a fun and enjoyable film for adults as well as children.